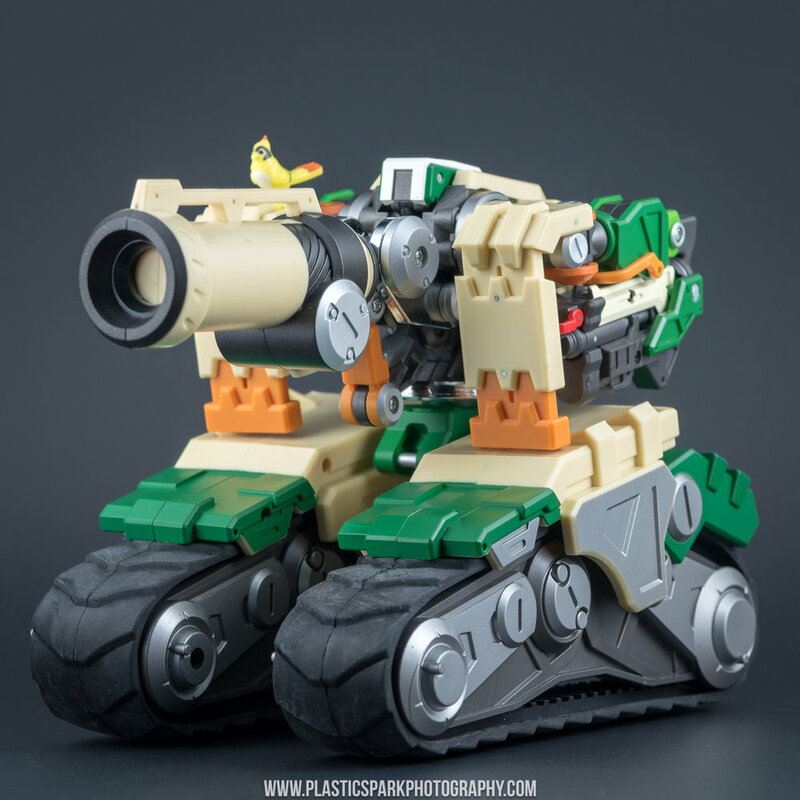 DX9’s Kaleidoscope series begins with this cheeky re-creation of Bastion from the multiplayer team shooter, Overwatch. 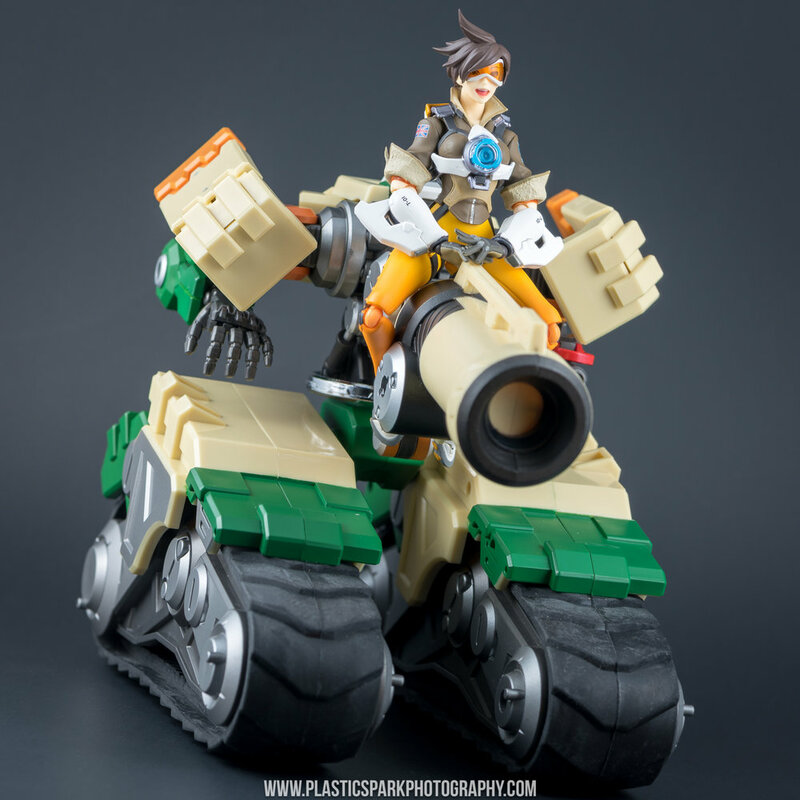 When I first saw initial images of the prototype figure I will be perfectly honest; I didn’t expect it to come to market. 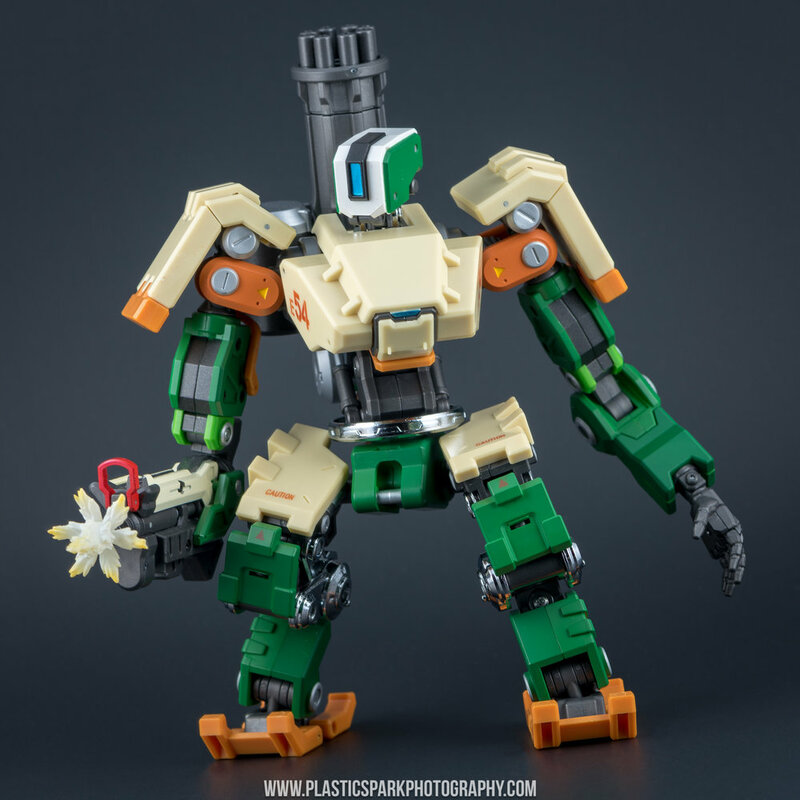 This was a near perfect replication of the Bastion character from Blizzard’s game and while the matter of IP tends to be a bit lax when it comes to Transformers, I had no idea what to expect with a character from another source like this. Luckily for me DX9 came through in a big way with a finished version of what they dubbed “Freeman”. 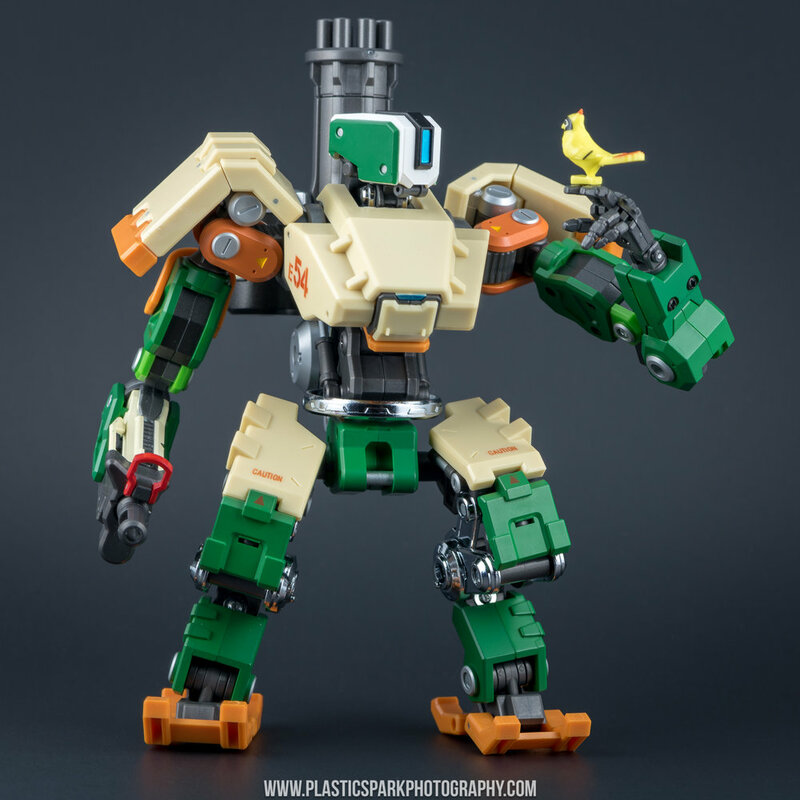 The color scheme and paint details are based on the basic skin and concept art for Bastion, and he even comes with his little bird friend; Ganymede. 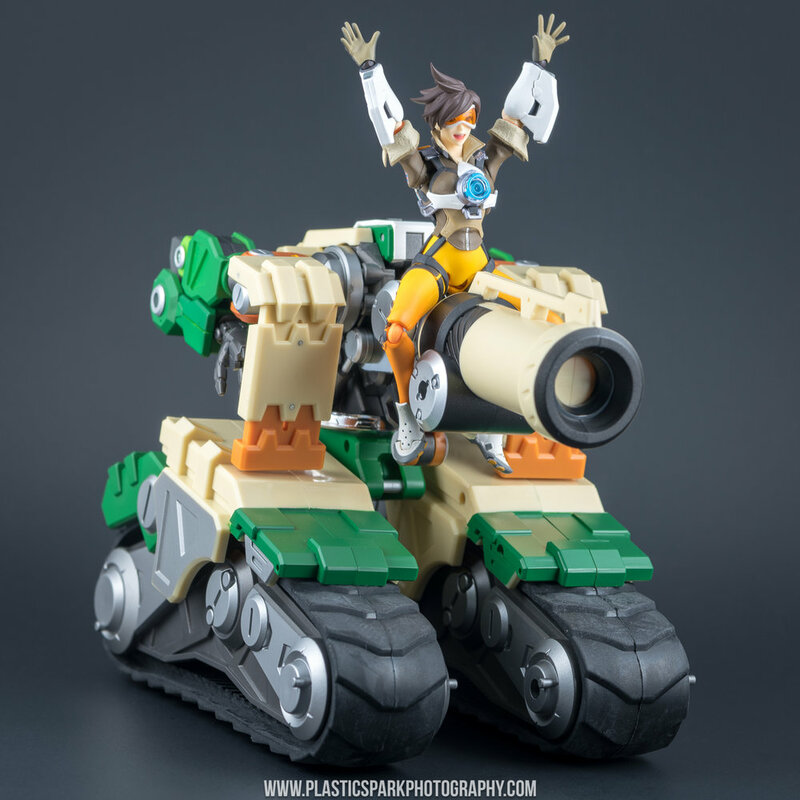 The Turret mode is very similar in form to the in game model however in the “official” mode it does sit very high up in comparison to his 3d rendered counterpart. The turret mode is also very large compared to its appearance in the game. The shields are adjustable and you can change out the machine gun turret for the cannon barrel if you want to customize this mode. 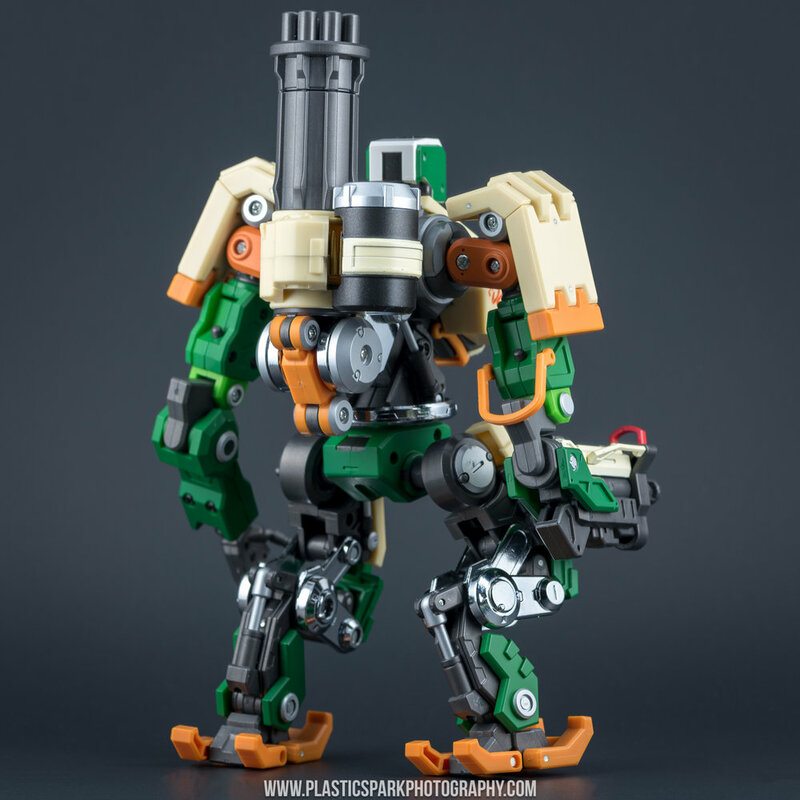 With some adjustment to the legs you can achieve a more low to the ground “fan” mode that sacrifices some aesthetic accuracy in the legs for a more stable looking turret. 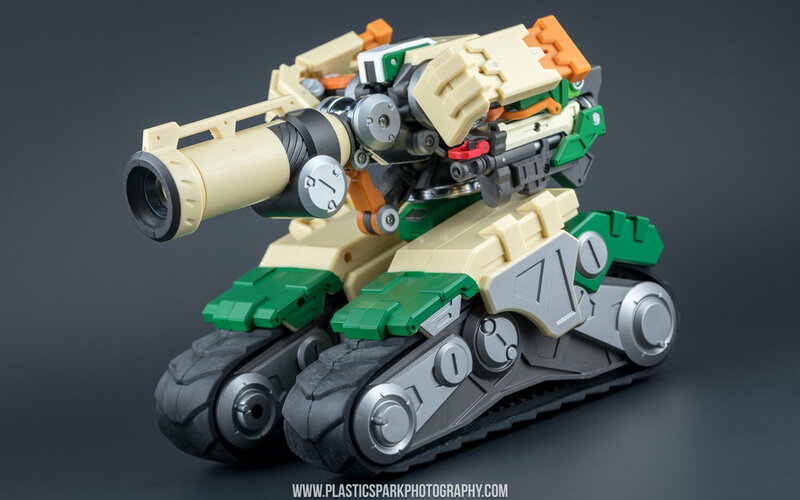 While the turret mode looks very good there is a severe lack of locking points meaning that the slightest bump will lead to the arms or other components coming out of alignment. It’s very easy to destroy the integrity of the turret mode if you aren’t careful. The legs can also be very tricky to line up perfectly symmetrical as the joint strength of the die-cast knee joints can be incredibly tight. The barrel also may sag if you move the unit around too much. I really think a few locking points or maybe even ratchets in certain joints would have been an asset when it comes to the alternate modes. Tank Mode is an interesting creature. The top half of Freeman stays pretty much the same as the turret mode, with the exception of swapping the machine gun turret out for the cannon barrel and adjusting the shield positions. 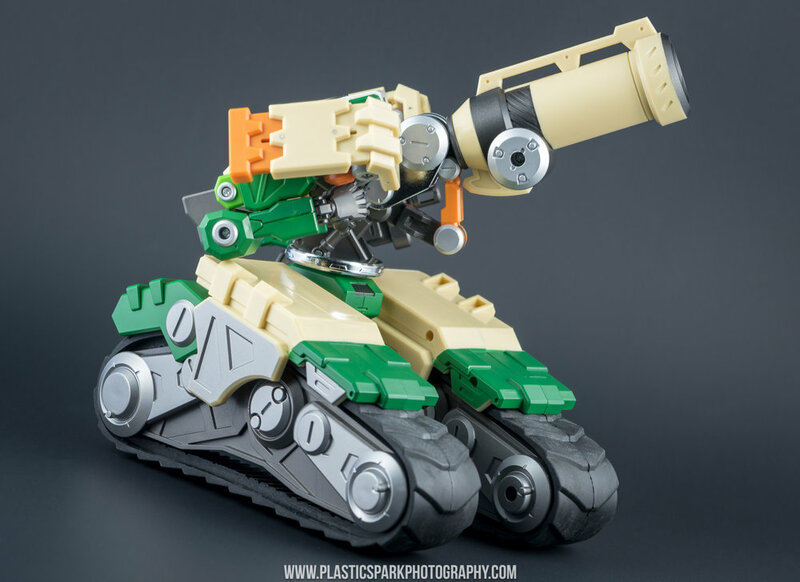 The tank treads are separate components that replace the entirety of the legs on Freeman. This leaves the waist joint accessible to turn the turret 360 degrees. I initially thought this was achieved by popping the legs off at the ball joint but thankfully a much more effective and less risky method is used. 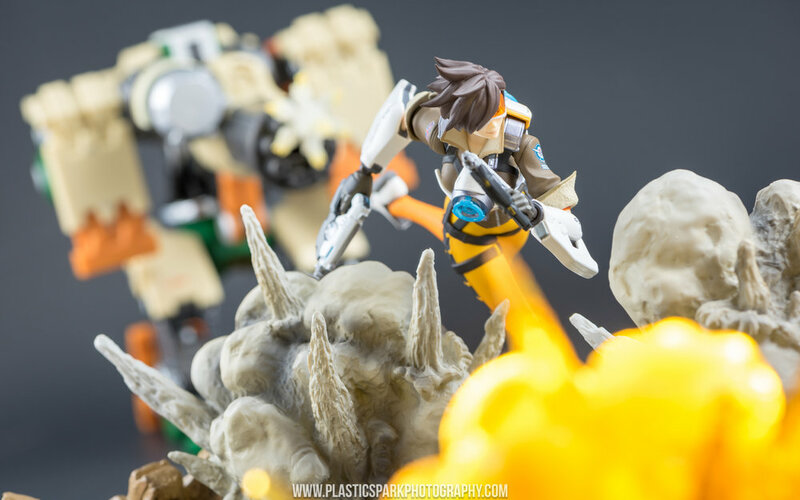 The legs can be completely removed by pulling straight out to the side and the entire stalk that the ball joint is mounted on is removed. The tank tread legs are then attached in a similar method by pushing the stalks on the inside of the treads into the waist piece of Freeman. This creates a rock solid connection without any risk of disconnection or the treads coming out of alignment. The downside: you are gonna be pulling like The Incredible Hulk to try and disconnect these guys. The connections on mine are hella tight. I’m gonna try lubricating the connection with some shock oil to prevent damage and ease the process. Hopefully that resolves any concerns. 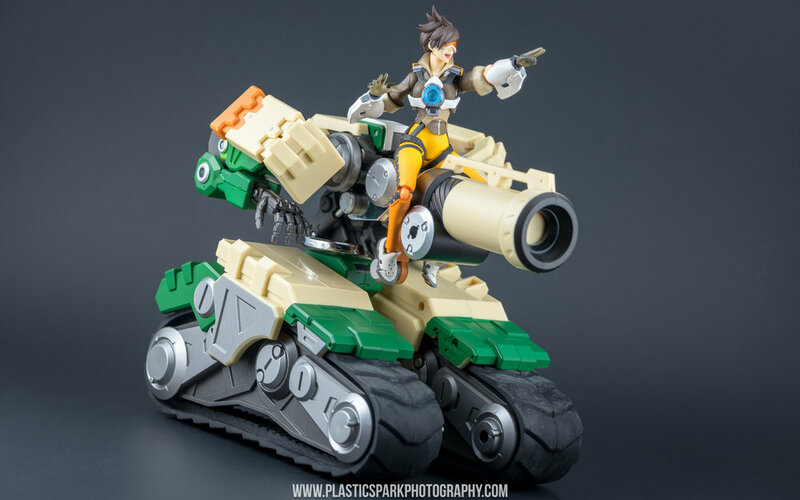 Freeman’s recon mode is as near a replica of the in game Bastion model as I think anyone could achieve. Every single detail is represented to an unbelievable level. The sacrifices made for the turret and tank mode really come to fruition here with a gorgeous robot mode. He’s got enough articulation to be really expressive and pull off most of the poses you might want to replicate from the game. I would have liked a little bit of weathering but there’s something to be said for a clean art-accurate deco. Articulation is pretty well executed with only a few small issues here and there. His head is on a ball joint though there is a rubber hose in the rear that will limit a full rotation without causing some damage. 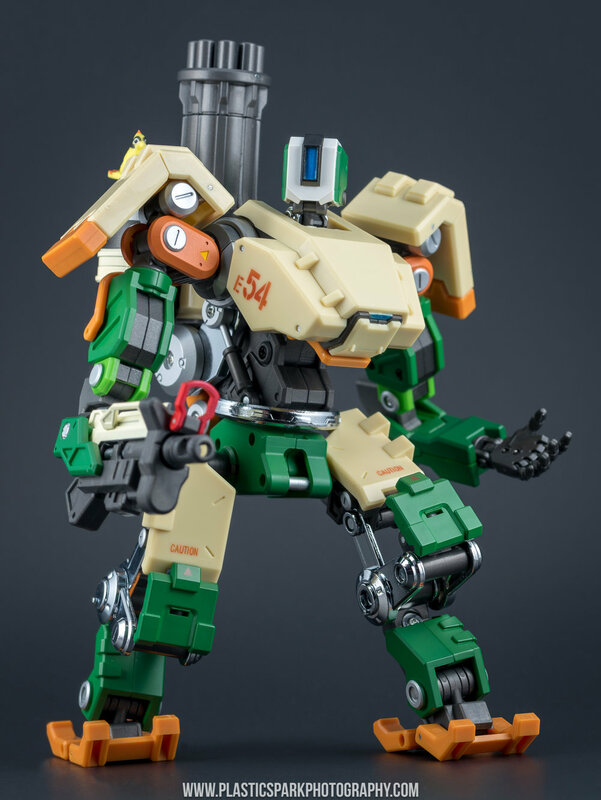 His shoulders are double jointed outward with a ratcheting joint at the base of the shoulder that allows a full 360 degrees of rotation. His elbows are double jointed and fold tight to the bicep for transformation. 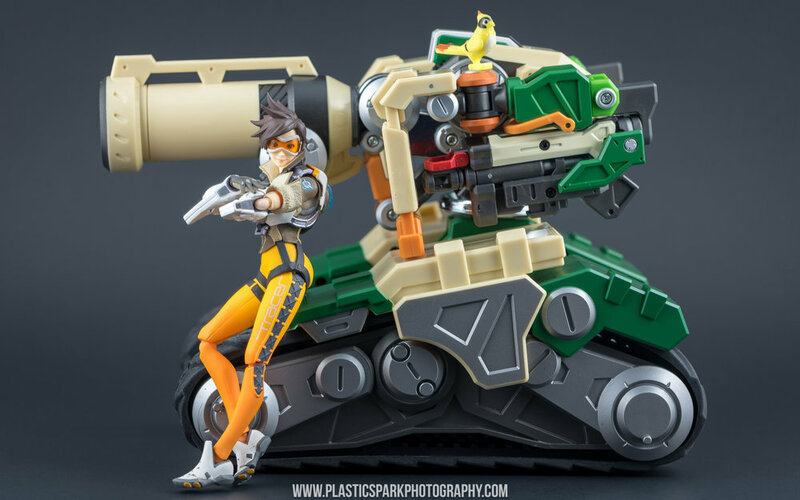 One nitpick for me is that the gun arm can’t bend further than 90 degrees meaning it is impossible to show Bastion holding his gun up any higher than his waist. 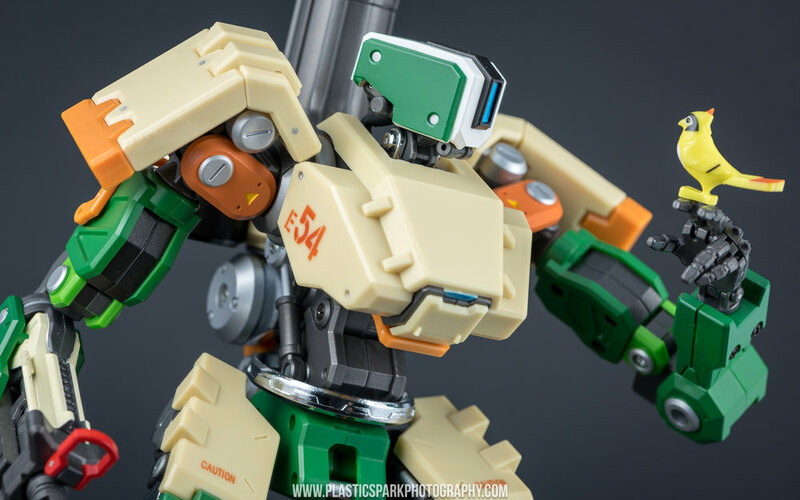 After taking these photos (of course) I learned that the barrel of Freeman’s weapon can actually extend out from the main body. I’ll add a few updated photos* showing this feature soon. On the other arm his elbow works as expected, and he has a semi-articulated hand. The fingers all have a ball joint at the base but be extra careful with them! One of mine came broken in the box (I was able to glue it) and they all show signs of stress at the ball joints right out of the box. This is easily the weakest piece of this figure as almost everything else is incredibly sturdy and well built. DX9 could have done better with a fixed fist, or even swappable dynamic hands. There is a functional ab crunch with working pistons 360 degrees rotation at the waist, ball jointed hips, and multi jointed knees. The die-cast knee joints are incredibly strong, possibly too strong if I’m honest as they can be a real chore to make fine adjustments to. One of the legs on mine straight up requires 2 hands and more strength than I would ever feel comfortable using if the joint weren’t made of pure metal. Freeman’s ankles are ball joints and his feet are able to adjust height/angle to accommodate a number of postures. 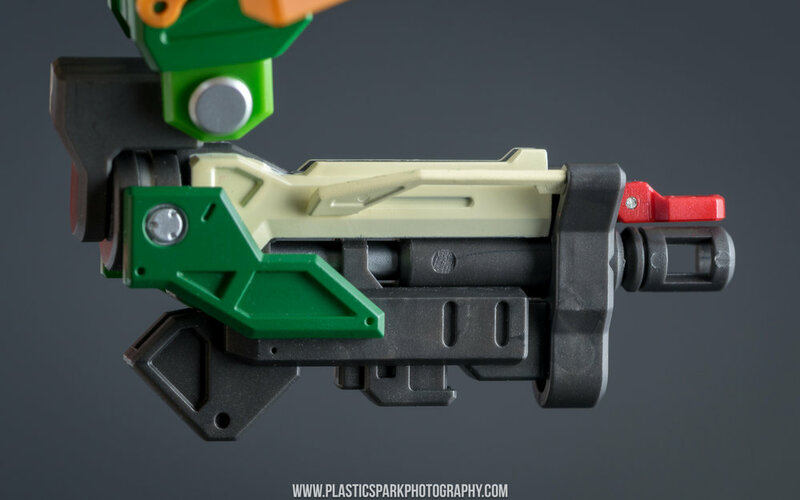 There’s even a hidden slider that is locked in by the green armor on his shin. The ankle joints are a little weak to support all the heavy die-cast weight in the main body so sometimes you might find him leaning a bit if you’re not careful. 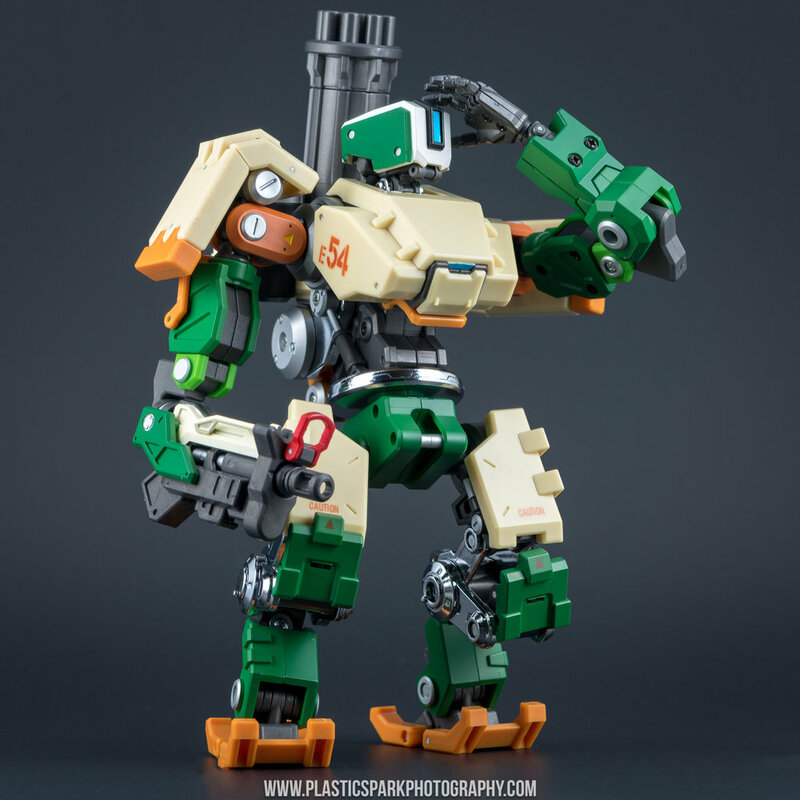 Freeman is close enough to perfect when it comes to a functional Bastion facsimile that I really have to recommend him to any Overwatch fan. 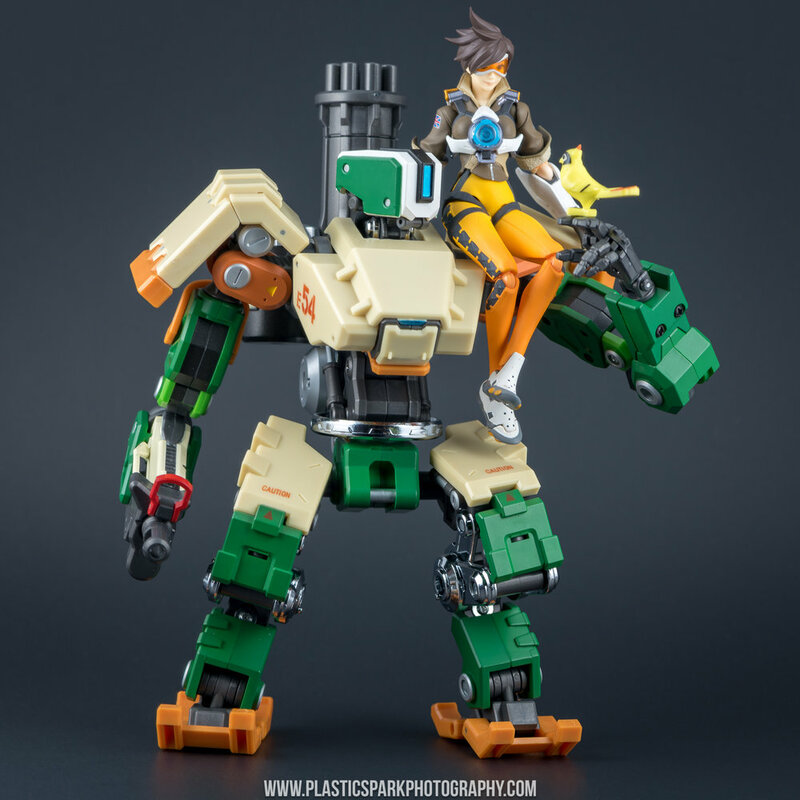 He’s a great companion piece to Figma Tracer (and soon Genji) and looks at home on the desk or display case of any robot/mecha collector even if you aren’t into Transformers and other more popular robot toy lines. 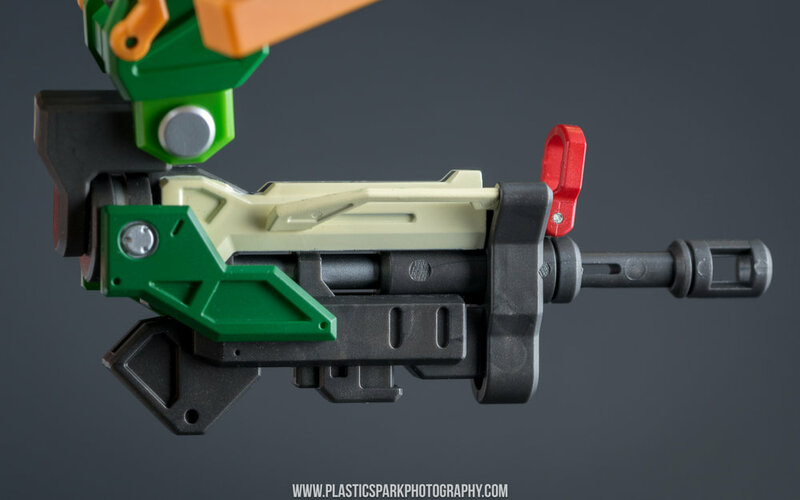 If the figure ends up with additional future releases, be they a re-release or a new deco, I hope they address the hand, and elbow on the gun arm. Otherwise I feel like he’s pretty darn great and not much really needs improvement. Thank you so much for checking out my review and photos of DX9 Freeman! I hope you enjoyed it and check out the full gallery below! Leave a comment down below, or email me at plasticsparkphotography@gmail.com with any comments or input you'd like to share! Don't forget to check us out on Facebook as well!